A Late Hello and Happy New Year. I’m so sorry I haven’t been here lately – I’m rubbish at this regular blogging thing – just been concentrating on packing lovely stuff on my website. That is still an on going process but I think it’s looking better now. Where does the time whizz to? We’re already speeding through February and I’m still getting over Christmas! Things are moving along nicely for our Craft Retreat ( 3-4th March) and I am really excited about the projects we will be making. I will be bringing you some sneaky peeks over the next couple of weeks, so watch out for that. All I will say at this point, is that one of the projects is going to be a Timmy configurations shadow box but not as we know it – think outside the box! We have now got stock of IndigoBlu’s latest products – the FlitterGlu and MegaFlake as well as the starter kit – check out the website for those. There is a fantastic offer of the week too of a beautiful Sport scrapbook kit for a ridiculous price, so check that out. So the workshops are back up and running, although off to a very slow start I have to say. Where are you? I miss you. We have some lovely projects lined up for you but we can’t share if you don’t come. So here is a glimpse of one of the samples for our “Simply Creative” session. 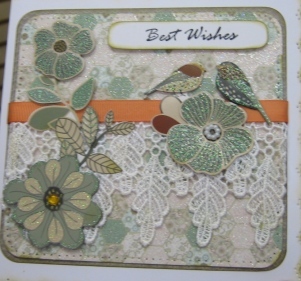 This particular card was designed by a lovely lady who works for Trimcraft and I’m sorry I don’t know her name but what a beautiful sample. We will be making something similar and more besides. The products we will be using are from Isabelle from the New Edition range and they are really lovely. Some are glittered, some are double sided and we will be teaming them up with gorgeous glittered floral and bird stickers and matching gel stickers. And what’s more, any stickers which aren’t used in the class, you get to take home with you. So why not come and join us, you can find the dates and times for this and all our other workshops on the web site.